TEACHER RESOURCES what you see is this abstraction, and what we’re hoping you will do as audience is figure out how you might put those together in your own way. Purni Morell We would suggest familiarising your class with the simple plot outline and the characters in the opera, which will give them simple ‘hooks’ into the piece, and to then encourage them to follow their own associations as they experience the music, images and the dynamics of the performers and the characters they depict onstage. You could also ask students to discuss the differences between live and recorded music and highlight the amazing physicality of how opera singers use their voice, using their whole body as an amplifier, developing their breath so that they can create such a powerful sound that doesn’t need to use a microphone. You can compare opera singers to athletes in the extent to which they need to train physically. ABOUT THE OPERA Written in 1680, Purcell’s Dido and Aeneas tells the story of Dido, queen of Carthage, and Aeneas, the Prince of Troy. Based on Book IV of Virgil’s epic poem the Aeneid, Purcell’s opera is his first and only all-sung work. The performing company will be made up of three principal singers, seven members of the orchestra, the conductor and twelve chorus members. The instruments you will see on stage are two violins, viola, cello, double bass, harpsichord and theorbo. 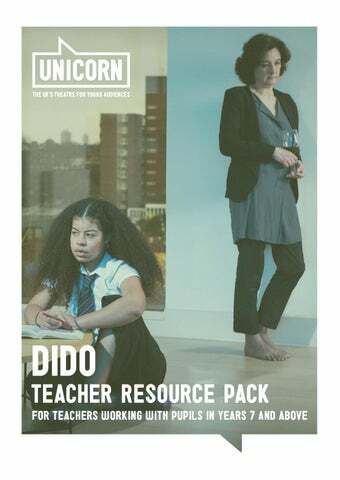 TEACHER RESOURCES A grove during the middle of a hunt Dido and Aeneas have stopped to take in the beauty of the countryside and have a picnic when they hear thunder, and a storm breaks. The servants pack up to return to the palace. As they leave, Aeneas is stopped by the Sorceress’s elf disguised as the god Mercury, who tells Aeneas he must leave immediately for Italy, where he is to build a new Troy. Believing it is the will of the gods, Aeneas agrees to set off immediately, but is heart-broken that he will have to leave Dido. The palace Preparations are made for the departure of the Trojan fleet. Dido is distraught at Aeneas’ disappearance and Belinda comforts her. Aeneas returns, saying that he will defy the gods and stay with Dido, but she rejects him for having ever thought of leaving her, and tells him to go. In despair, Dido takes her own life. As she does so she sings her last aria, “When I am laid in earth”, also known as ‘Dido’s Lament’. She sings to Belinda: Dido: When I am laid in earth, may my wrongs create no trouble in thy breast. Remember me, but ah, forget my fate. UNICORN THEATRE AND ENO VERSION FOR 2019 In this version of the opera for audiences at the Unicorn, director Purni Morell has made a few simple changes to the original. The production acknowledges that we are all, performers and audience, together in Southwark in 2019, and have gathered to share in this experience. Belinda is not Dido’s handmaid: instead, it is implied that she might be her daughter. In the original, Dido and Aeneas go on a hunting expedition. Here we will see them go on a picnic. As Purni notes, ‘It’s Hyde Park, they’ve been to the food hall at Harrods - they may go boating later.’ There are no witches and no Sorceress in this production - they are instead the voices inside Dido’s head, her own inner demons. The witches singing as they watch Aeneas’ fleet sail for Italy has also been cut from this version. Please note: In this production, Dido’s suicide will be in keeping with our modern staging of the story. While in the Aeneid, Dido falls upon Aeneas’ sword on top of her own funeral pyre, Purcell’s opera does not specify how she dies. In this ENO and Unicorn Theatre production, the method of suicide will be contemporary and recognisable as the actions of someone in 2019, rather than in an ancient mythological world. Decisions about the staging of this scene will be made during rehearsal period - if you would like further information closer to your visit, please contact schools@unicorntheatre.com. In the Aeneid (Virgil’s epic poem which the opera is based on), Dido has a sister called Anna, in Purcell’s opera she has a lady-in-waiting called Belinda. I had seen previous productions where Belinda is her daughter, not her lady-in-waiting. I thought that was really interesting because if you change that, then the story of Dido becomes the story of a single parent who makes bad relationship choices and I felt that was something that young people could connect with. I wanted to make it feel more contemporary, so we’ve kept the music as it is, the original Baroque opera, and we’ve given it a contemporary look. And the implication is there that Belinda is Dido’s daughter, though she’s not in school uniform - it’s not absolutely clear, and we’re not saying ‘This is definitely her daughter and this is what happened in Peckham last week,’ we’re saying ‘Come and have a look at this.’ I was interested in the way in which a lot of teenagers are there to support their single parent’s emotional life, when in a more traditional set-up, that parent might have other adults to talk to about her problems. My mum was like that, she used to come out of therapy and tell me all about it straightaway, and I thought ‘I’m not sure that’s a good idea.’ I was interested in that pressure: Belinda needing her mum to be happy, and putting a lot of effort into looking after her. You know, I think young people look after adults much better than adults look after young people. That is an obligation she has, but she’s hoping that it will magically be alright. We’re staging it in the abstract, so there’s no narrative, we’re not anywhere, we’re at the Unicorn. The implication is there that the relationship there is something you might recognise. The other idea we’re working with is taking the idea of the witches, which would be normal in 17th century opera, but not so much now, and re-interpreting those as aspects of Dido and what she’s battling with. TEACHER RESOURCES you see is this abstraction, and what we’re hoping you will do as audience is figure out how you might put those together in your own way. One thing is the way we talk about relationships; the chorus are very into the idea of Dido getting together with Aeneas, and Belinda is as well. It feels like there are resonances with how ads look and popular culture: stereotypes of what a successful life is supposed to look like. And I’m hoping that through this abstraction, the hypocrisy of that might come through. We both have short patience for the continuing gender imbalance in the world. What Dido does is super traditional - she’s a classical heroine, she falls in love with the wrong man and then kills herself. So we’re interested in presenting the notion that quite a lot of what happens is really absurd. One way we think that will work is that the music is sublime and the story is quite violent and ugly; so by putting these two things together and, without seeking to explain them, we can imply a little of the absurd situation. And staging an opera is quite an absurd thing to do - to ask some people to sit and listen to what some other people can do is, in essence, odd. We want it to feel odd with a feminist twist. In form, it’s a random collection of scenes that we have put together, in the way that life is random. I think that by demystifying, removing the notion that we came with a plan, that opens up a bit more space for the audience to feel that they have the room to put this together in their minds, and come to their own conclusions. Broadly, the philosophy we are dealing with is that everything is set now, because it is now, and everything is set in the Unicorn, because that is where we are. And we have no interest in asking anyone to believe that we are in any other place or time. One thing about the form is that it’s going to be at the Unicorn. As someone who isn’t that far off the age group that we’re making the production for, I wanted to make sure that the experience of opera was not alienating or intimidating, that the way we designed reflected that. TEACHER RESOURCES you’re going to see the musicians playing. We started with the fact that they are going to have to be there. What we’re going for is a feel that these twenty-three people have got together to do this opera in this slightly deconstructed way for us. They’re not telling us a story; they’re just doing it scene by scene and making it as they go, so we can see all the workings that go into making it happen. What I’m interested in is highlighting the artificiality of the form; opera is a very heightened form. So when I think of the big aria of Dido’s, I imagine how it’s lit, and how it’s staged will be an “operatic moment”, but we’ll make an operatic moment and then we’ll diffuse it, and then make another operatic moment. We’re not saying we want you to believe the operatic moments are real; we want you to see them as operatic and constructed. And we’ll be exposing the space as much as possible, and seeing the workings of the opera and the theatre as much as possible, rather than hiding bits of scenery and seeing them magically appear. Having the orchestra on stage forced us to steer the design in a particular direction, which is good. 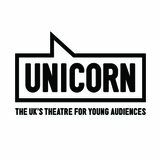 WHAT ARE THE CHALLENGES OF STAGING THE PIECE AT THE UNICORN? PURNI The challenges are mostly to do with expectation of what opera is. We don’t know what the challenges are going to be because we haven’t started working with the musicians or the singers. So really simple things, like they’re used to working different lengths of hours in a day; they’re used to doing a tech in a day, whereas we would take three or four; they’re used to not changing anything and not having any previews, and we’re used to having ten previews and changing loads as we go. So there are lots of challenges for me and Valentina [Peleggi, conductor] to work out together. Large orchestras are too expensive to have at every one of our rehearsals, so it’s only really possible to bring them in towards the end of the rehearsal period. For Dido we are using a harpsichord for the rehearsals and the ENO orchestra will join us for our final rehearsal. That’s all fine, but we need to make sure the timing of what you see is set to the music, which is a lot of what you’re doing in opera. I’m learning lots of things that in opera are so different to theatre, just simple things like the orchestra not usually being seen on stage, and things being very much more set on before we enter the rehearsal room. One of the biggest challenges is that in the Unicorn, we don’t have an orchestra pit; we had to take a certain route with everyone on stage in the act of putting on these tableaux, in which we construct scenes. In the opening, when the audience come in, we will see the orchestra and the singers just being themselves, having a little chat, meandering around the space, tuning up their instruments. TEACHER RESOURCES IS THERE ANYTHING YOU THINK YOUNG AUDIENCES SHOULD KNOW OR UNDERSTAND BEFORE THE SHOW, IN ORDER TO GET THE MOST OUT OF THE EXPERIENCE? PURNI No, absolutely not. Presumably we will get an audience that has different levels of knowledge; I imagine we might get some teenagers who are really into opera and know quite a lot about it, and we might get some who have never been at all. So it will be interesting to experience what those reactions are. What we hope the audience gets is not that we are telling a story, we have no interest in suspension of disbelief. The opera is as deconstructed as we can make it. Rather than telling a narrative story, we are sharing moments in this opera, which correspond to moments in the narrative story, with the audience. So we are hoping that our audience will receive them as somewhat disjointed, and that they may not necessarily make sense. It’s an associative experience that we’re interested in, rather than saying ‘This is what happened to Dido when she met Aeneas.’ I personally believe that young people are much better at looking after adults than adults are at looking after young people, and I think that’s most young people’s experience. Whether we still think that as adults, it’s probably what we thought growing up, and so that’s something that I’m also interested in. Hence in the design, we don’t necessarily want to give the impression that we, the people who have made this opera, know what we’re doing. What we are interested in, essentially, is here are twenty-three people: a conductor, seven musicians, three principles, twelve chorus, who have come together in this space - we are always in SE1 - and what these people can do, if they put their minds together, is put on an opera for you. Which is what they are going to do. Purni Morell is a freelance theatre director, writer and translator. She was formerly Artistic Director of the Unicorn from 2011 – 2018 and now lives in Antwerp, Belgium. For the Unicorn, as translator: A Winter’s Tale, Henry V, The Fourth Wise Man and Othello; as director, A Winter’s Tale, Dora, The Velveteen Rabbit (also New York, Barcelona and Seattle), Baddies: the Musical, My Father Odysseus, Big Love and Version A (the last two co-directed with Christian Roe) Outside the Unicorn, her writing work has been produced by ATC, the Finborough, Speeltheater Holland, Seattle Children’s Theatre, Muziektheater Transparant, ‘t Arsenaal, Vlaamse Opera, Gent. Most recently as director: Public Enemy: Flint (Michigan, coproduced by fieldwork, the Goodman, Detroit Public Theatre, Centerstage Baltimore and others) and Alpha Beta (Finborough Theatre, nominated in the Off West End Awards for Best Director, Best Actor and Best Design). TEACHER RESOURCES Khadija Raza is a performance designer based in London. She studied BA Design for Stage at the Royal Central School of Speech and Drama and was winner of the Linbury Prize 2017 for the Unicorn Theatre and Stage Debut Award for best designer, 2018. Credits include: As designer: Cacophony (Almeida Theatre and The Yard), Philoxenia (Bush Theatre), Spun (Arcola Theatre), MIXTAPE (Royal Exchange Theatre), Hijabi Monologues (Bush Theatre), I want you to admire me/but you shouldn’t (Camden People’s Theatre) and as assistant: The Unknown Island (Gate Theatre), L’heure Espagnole and Gianni Schicci (Opera Nationale de Lorraine). MAKING THE OPERA INTERVIEW WITH CONDUCTOR VALENTINA PELEGGI WHY DID YOU WANT TO CONDUCT DIDO AND AENEAS? This is a piece written more than three hundred years ago, and yet there is something that makes it feel still real and valid. It can be read and approached in many ways, but it has its own magic so that however we look at it, it speaks to our heart. This is the magic of the opera, where people don’t speak but sing. This is because it is through the music that emotion is shown; it shows how the characters feel about what is happening. WHAT EXCITES YOU ABOUT THE UNICORN’S PRODUCTION, AND WHAT DO YOU THINK THE CREATIVE CHALLENGES WILL BE? I find it very interesting that Dido and Aeneas was written originally for young people, more precisely, for a girls’ school. I don’t see challenges; I see possibilities and opportunities to connect. Our choice is to have a quite intimate and personal experience with the piece: the space at the Unicorn is open, and there is no separation between singers, players and audience. It will help in welcoming everybody to feel part of it, as there is no separation between the world on stage and offstage. The story we will tell happened centuries ago, but could happen today, and could happen in 300 years from now. Valentina Peleggi is the ENO Mackerras Conducting Fellow for this season and next. She studied in Rome, Siena and at the Royal Academy of Music, winning the top prizes at each institution. She made her ENO debut with La bohème in February 2019. Resource pack for teachers working with pupils in Years 7 - 13.